Last week I spent time with some excellent women. They had gathered to celebrate the 39th anniversary of their first meeting, a follow up to a religious retreat. They meet weekly to check in, to keep each other on track, and to support one another in their religious journeys. Over the years, this group’s focus has evolved (my term) from a pious one to a broader effort – that of supporting each other through the voyage of their lives. Their ranks have been reduced by death, and now, only five and in their 80s and 90s, those remaining have stood together in sorrow. They have sat with one another in grief. They have shared their joys. What a privilege it was to observe them, to contemplate their aging, to ponder my own. Most have difficulty walking. I’m sure that all have aches and pains, though this was never mentioned. Some are more physically infirm than others, but all soldier on. All but one have razor-sharp minds. One, always the one you’d least expect, suffers from memory issues. She, who was beautiful and fey and who knows that she can’t remember, covers her lapses with laughter and giggles that are all the more tragic. The group is kind, and I wonder if each of them, for now untouched, is not somehow relieved that it is she, not they, who has drawn this dreaded wild card. They welcomed me into their fold, and talked about their lives. Ever confident of their beliefs, they seemed to understand my journey of doubt, of questioning, of wishing for, and not finding, answers. A different generation, housewives all, sure of their roles to support, not compete with, their spouses, certain that they would be taken care of. All but one is alone now. There was refreshingly little talk of children. This day was theirs. I focused on them, each remarkable in her particular way. And I wondered if this pre-feminist cohort, this generation who accepted roles without question, or at least without too much questioning, is not more content. Maybe it was the time, maybe it has been their firm religious beliefs, and, just maybe, it has been the support of the group that has given them the strength, the courage and the force to be content. Or perhaps, in the night, they too wonder. These last August weeks, cool early mornings on the sunporch. My mind wanders back to Rock Springs, the house where I grew up. August meant that school would soon start, something I always looked forward to. In August, I started counting the days; in August the issues of Good Housekeeping and Ladies’ Home Journal arrived, always with a cover of a school girl in a dark plaid dress (or so it seemed to me). It was then that I told my mother that I was ready to shop. She was always ready. We headed to Hochschild Kohn’s, Edmonson Village, where she knew the buyer for children’s clothes. I would pick out one dress, plaid. She chose more, many more, more than I wanted. (I was an “under-purchaser” even then.) She thought that it would make me happy. It didn’t, and I acted like a brat. 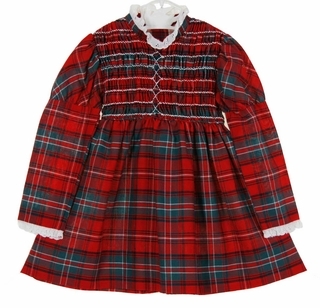 It was only when I was too old for back-to-school plaid dresses, too old for back-to-school, that I realized that, when she was a child, she had always longed for a closet packed with school clothes, a different outfit for every day. She wanted to give that to me, who didn’t want it, who didn’t appreciate it, and who would never have quite as large a wardrobe as I needed. I’m sorry that I wasn’t grateful,more appreciative. I’m sorry that it took me so long to understand that what she was giving me meant more than clothes, more than a full closet, and I wonder what I have given to my child that, in the end, is really about me.